Irene Woodward, born 1862, signed and incsribed "Age 20..." on this carte de viste. Probably for sale to adoring fans at the circus. That’s if we can believe she was 20 when she signed the the back of the card. My other job is working in a liquor store so I’ve gotten pretty good at guessing people’s ages. All women lie about their age, usually shaving off a few years but still, I would not card her. This young lady, as radiant as she is, probably is not under 21. But she could have been tattooed around 1880, considering she was born in 1862. Eighteen might have been the legal age (if there was one) for this kind of enterprise. 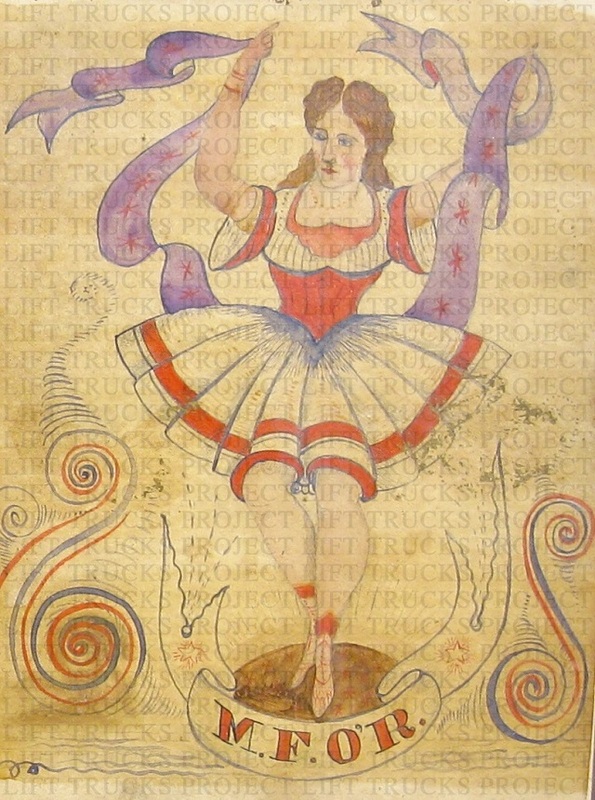 She almost went down in history as the first tattooed lady in the circus game, short by only a few weeks. The inking was most certainly done by Samuel F. O’Reilly. 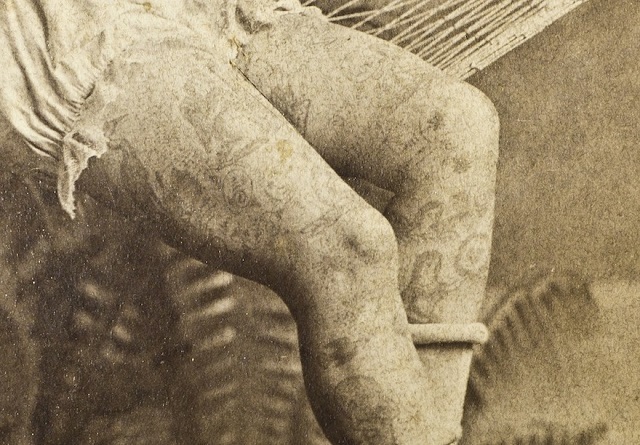 Although she claimed abduction by tribesmen in the South Seas, Mr. O'Reilly's signature swirls and embellishments can be seen adorning her legs. We love the hand tinted pink carnation on her shoulder. Nice touch Mr. 1880's Photographer guy! Looks like somebody from " An Artist Formally Known as Prince" music video traveled back in time and got Shanghaied by a tattoo artist. Which just might have been the best thing that happened to Ms Woodward, because let’s be frank, the 1890’s must have been dreadful. Cover page from an O'Reilly sketchbook. Note the swirls and action line dash's, all signatures of his splendid work. We salute you, La Belle Irene! And a tip of the cap to the master tattooist Samuel F. O'Reilly. 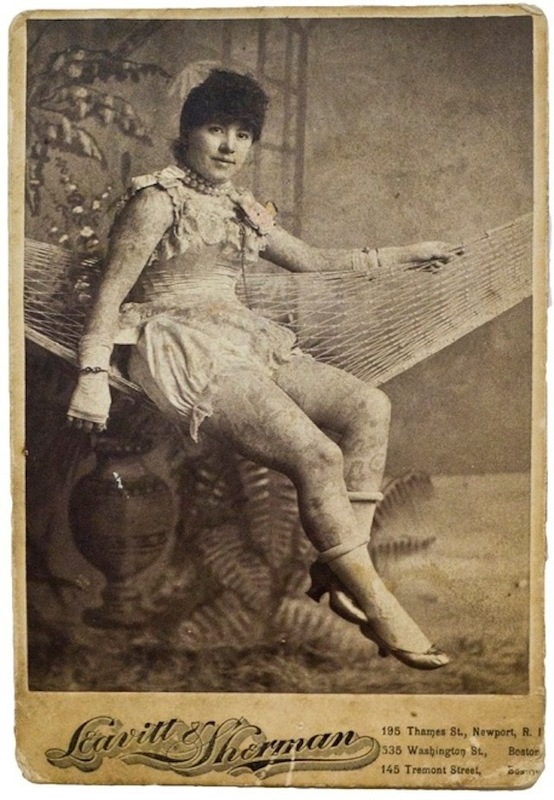 "Irene Woodward, also known as La Belle Irene, was a tattooed lady who performed during the 1880s. She made her New York debut just weeks after Nora Hildebrandt to great fanfare, including a report in the New York Times. She worked at Bunnell's museum and successfully toured Europe. Onstage, she claimed to have been tattooed by her father, and, in a break from the usual tales of forcible tattooing, claimed she actually wanted the work done. Woodward was actually tattooed by Samuel O'Reilly and his then-apprentice Charles Wagner. At times, she claimed to have been inspired by having seen Constantine. In 1883, she married a showbiz man named George E Sterling with whom she had a son, also named George, and spent 15 years in the circus. She died in December of 1915 at the age of 53 in Philadelphia, Pennsylvania."